I attended an Open Forum with the CEO of Benevolent Dictators Inc. this morning. He is a very powerful and influential man who meets regularly with the heads of other countries to discuss the economic climate in their particular quadrant of the planet. People tremble when they find out he’s in the building. I was ready to be numbed by a recitation of corporate clichés but was pleasantly surprised to find it all very interesting and cliché free. I love listening to really articulate, intelligent people discuss the thing they’re most passionate about. He gave us his current market theories and it didn’t feel like a professorial lecture. I talk a pretty good game but I’m actually not all that bright so the fact that I “got it” is a testament to the clarity of his message. The best part was his discussion of emerging markets. He spoke of the importance of having “feet on the ground” (meaning “employees”—okay, so he indulged in ONE corporate cliché) in Sub-Sahara Africa, Brazil, China and the Middle East. He said there’s a historic shift of wealth out of the Western world and to these other areas. That would matter to me if I had any wealth that was about to shift. Lamp 1 is about to ignite. An IT guy got up in a damn hurry to—I don’t know what—blow on lamp 1 to cool it off, I suppose. I thought that was a fitting metaphor for the state of the U.S. markets. I took visiting Bro and Niece on a walk though a nature preserve. The county maintains a series of beautiful walking paths that twist through some pretty thick woods. It was just two dads and their daughters out for an afternoon stroll. Tra la la. We were wondering if it was safe to let the girls get far enough ahead of us so that we could smoke some weed without them knowing, but decided that it might look really bad in a police report. We turned a corner and a deer was standing in the middle of the path eating about 15 feet in front of us. It was pretty big and although I don’t think there was any inherent danger, it wouldn’t stop eating and move, so it made me nervous. It would occasionally look up at us but otherwise, it completely blocked the path and clearly had no intention of going anywhere. I started clapping and waving my arms. Then I sang Rush’s Tom Sawyer out loud and that didn’t do anything either! I wanted to get a pic of the girls standing in the path with the deer right behind them, so I pulled out my camera. The deer looked up, saw that I had something in my hand and took off. I’m not insinuating that the deer was photo shy, but it saw me pointing something metallic at her and that was that. I’ll always wonder what that was. We dropped them off at Newark airport a few hours ago. I love hosting company. I got to show off my city, beaches and forest, but it’s also really nice to have my home back in order. 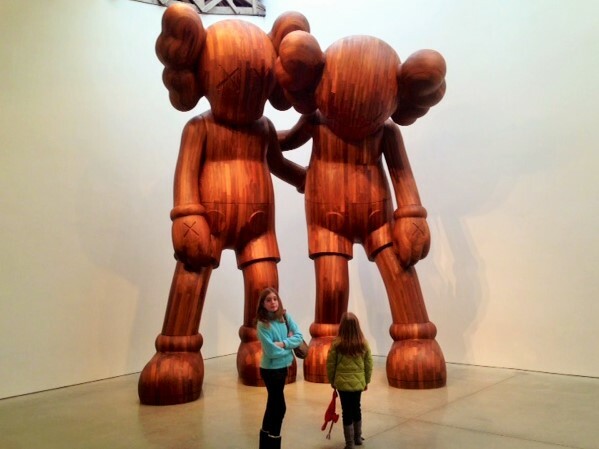 I took visiting Bro and 8-Year Old Niece into Manhattan today. That place is better than DisneyWorld. It’s less real. I rowed them around on Central Park Lake. I love watching city folk attempt to row a boat. The preferred method for urbanites seems to be to sit facing the stern of the boat and then “pushing” the oars in the water. What a bunch of idiots! We walked down the mall and over to the carousel. I love the Central Park carousel. I’ve been on that thing dozens of times. It was 90¢ for a long time but now it’s 2 bucks. Still worth it! There’s been a carousel on that site since 1871. The first carousel was propelled by a blind horse and a mule (much like the company I work for). 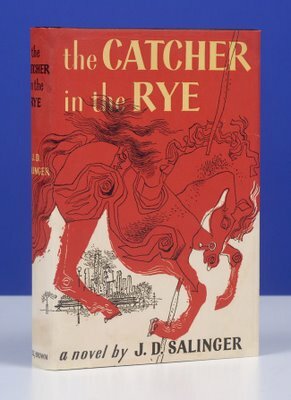 There’s a beautiful abstract illustration of the carousel on the first edition dust jacket of Catcher In The Rye. I lifted 6-Year Old Daughter onto a horse, strapped her in and mounted the horse next to hers. The ride started and her face showed the kind of careless joy that is inherent in all children, but is beaten out of us as adults. The carousel has a great big Wurlitzer organ that started playing Somewhere My Love (Lara’s Theme from Dr. Zhivago) and for some reason I got all choked up and almost wept. What an incredible puss, I am. Have you seen my testicles rolling around anywhere? They seem to be missing. We gave the girls the choice of going on a sun-drenched boat ride in New York Harbor to the base of the Statue of Liberty or visiting M&Ms World in Times Square. They overwhelmingly voted for M&Ms World, which I took as a personal defeat. M and C are here from Ohio for a vacation. Today, we took them to the beach. We have some spectacular waves and rip currents here today courtesy of Hurricane Bertha. Mrs. Wife, who is a Jersey Shore native and knows a lot of stuff about the ocean, told 8-Year Old Niece that rule number one when you’re at the beach is to never turn your back on the ocean. Well, she did, and a phantom wave snuck up behind her and knocked her down. M had to rush to her rescue and was also knocked over. Everyone is okay but M lost his $400 glasses. His glasses are sleeping with the fishes. The appeal of coming out here and staying with us was that it’s an inexpensive trip. That’s called an irony. Does anybody know what that is? I suddenly felt the weight of the illegality of my cell phone jammer. I didn’t stop using it. It just made it all the more thrilling. I had dinner in the West Village with H this evening. It was spectacular out. One of those warm, low humidity nights that make you want to walk the streets forever. I met her at Pearl River on Broadway. Pearl River is a bit hard to describe. It’s two floors of Chinese knick-knacks and clothing. Martial arts weapons. Imported foods. Dishware. Stuff. It’s great. You can walk into that place for a greeting card and end up spending $50 on nothing at all. 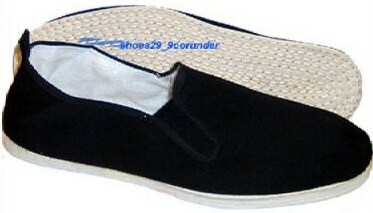 I bought new Chinese house slippers for Mrs. Wife and myself. They have cloth bottoms and wear out pretty quickly, so I bought three pair each. Only $5.95 a pair! You can’t beat it! They are insanely comfortable and lightweight for the summer. We walked across Broome through Soho, up Wooster and into the West Village. We went into three different restaurants and they didn’t feel quite right. Finally walked into Lupa and without even looking at the menu H said, “This is it. Let’s eat here.” Her feminine intuition was right on the money because it was one of the best meals I’ve had in quite some time. I had pappardelle with duck ragu. We split a prosciutto, parmesan and escarole croquette appetizer. They came in five small balls on a plate. I could have eaten 50 of them. Even the Italian beer was satisfying. A scoop of moose tracks on a sugar cone at the Tast-D-Lite on Bleecker for desert. Visitors arrive tomorrow for five days. Brother and niece from the Buckeye State. I love showing off the city. When I take tourists into the city, I see it through their eyes and it reminds me of how lucky I am to live out here. I’ve never lost my appreciation for this place, but a fresh coat of paint never hurts. Oh yea, we’ll probably do some stuff in New Jersey as well.